Finally a piece that's personal to me. Don't get me wrong, I love my projects and respect them very much, but tonight I found myself loosing interest. So I stepped back and finished a piece I started oh...man...a couple of months ago it seems. Hum...maybe not a couple of months, maybe about a month. I'm pretty happy with how she turned out. After I started painting the background I realized how empty it was. Then I thought "Leaves space for text." if there were some. :) But next time around I'm thinking I better make sure I make the space compliment the action. I could submit this piece for Illustration Friday this week...the word being "Legendary". Jesus Christ is a legend, the biggest one there is. I'm a new believer so when I painted this I envisioned this little girl to be me if I knew Christ at that age. 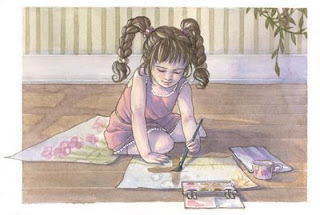 Of course, at that age I wasn't a big fan of watercolor. :P Wasn't a fan of watercolor till about junior year of high school. I love the subdued use of hues, it complements the feeling of serenity. She's adorable!! I love her hair and the serene feel to it. It reminds me of my kids drawing and painting! !